Monkey brains? Resin fruit bowl? Is it one of those things you stick on the window? Erm, maybe not, i don't know. Hmmm, Sara teased that she knows which made me think that I would be very clever and guess in an instant. No such luck. A drink coaster made of resin ?? Do you ship to Brooklyn, NY? My guess is a hotplate kind of thing, shaped like coral. I love the vibrant blue color! :) Guesses: coaster made to look like coral? But it looks almost wet/sticky! lol. Almost looks like a fancy drain grate cover, but I bet I'm soooo off right now. :) Can't wait to read about what it really is!! My guess is the same as the others, drink coaster or a trivet/pot holder. It is a very pretty blue, whatever it is! i better check out that Clipse album stat! I guess some sort of mold for a stamp or design...whatever it is, it looks like it will be neat! mwaaa haah haah *tenting my fingers* i'm so enjoying all the guesses! and lesterhead, yep, i'm prepared (and hoping) to ship these worldwide. hi Leslie - i'm so sorry for the weird blog glitch - i read your blog as a link from Sarah's -and i was having trouble leaving a post on Brie's today - and here it is on yours??! what the ?? anyways, hope you & Shane are well. i enjoy seeing your creativity. hee hee, no problem tish, although i was quite confused! happy to hear from you though, it was an unexpected surprise, i've added your blog to my bloglines. Hrmm, I have absolutely no idea! I can't work out if it is a mould of some sort, or a resiny kind of thing - maybe a pendant? Hrmm, yeah, dunno. But it looks interesting, that's for sure! my next guess - soap dish? The suspense is killing me, can't wait to find out! My guess for the blue mazy thing is that it must be some sort of Replacement Brain, which I desperately need by the way. At any rate, I'm intrigued! I'm guessing it's some sort of jewelry piece...but really I have no idea! I am looking forward to the unveiling! whatever it is I want to touch it! Maybe it will set hard and be a small dish or fruit bowl? AND it's a wonderful colour! 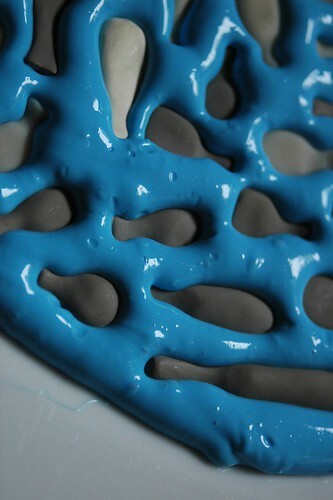 The blue looks like a rubbery stuff I've used before... I think if you could pop the little black things out the blue would make a fabulous fabric stamp.